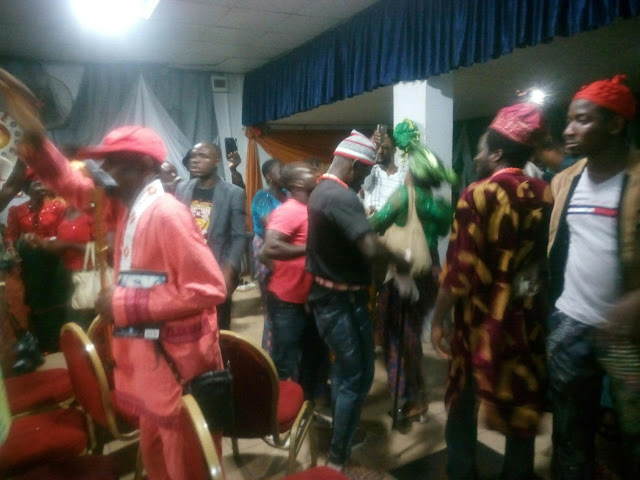 The leadership and family members of the Indigenous People of Biafra (IPOB) worldwide wish to clarify that events that took place at Eastern Consultative Assembly (ECA) gathering in Enugu on Tuesday, February, 27 is regrettable and unfortunate under the circumstance because it happened in the presence of the two most distinguished and respected elder statesmen we have in Professor Ben Nwabueze and Chief Mbazuluike Amechi. For this, we respectfully and unreservedly apologise to both elders and the leadership of ECA for how the ceremony came to an end. Regardless of who was involved, we are all indigenous persons from Biafra. Everybody, as long as you are indigenous to the territories comprising Biafra, is IPOB. So we view and have always viewed our highly regarded elders like Prof. Ben Nwabueze and Chief Mbazuluike Amechi as our own. What transpired at the said gathering is a protest against them or ECA but an indication of the level of loathing, anger and resentment against everything Nigeria amongst all right-thinking indigenous persons from the East. We respect our honest elders like Prof. Nwabueze and Chief Amechi and will continue to do so. What happened was a protest against one Nigeria project, not them. Nobody in tune with his or her senses will endorse the form of apartheid being visited on Biafrans by the current Fulani Nigeria regime of Muhammadu Buhari. What ordinary Biafrans are witnessing in Nigeria today is worse than what blacks experienced in South Africa that gave birth to the anti-apartheid movement the world over. We would like the world to view the outburst at Enugu as sign of what is to come in the near future. Our people and a majority of other people that wish to be referred to as Nigerians are all tired of the one Nigeria experiment and wish to go their separate ways. It should not be forgotten that the said event was going smoothly but for the occasional boos that accompanied any mention of Nigeria. Chief Mbazuluike Amechi was cheered to the rafters after his speech though this aspect has received little or no press coverage. What precipitated the collapse of the event was the announcement of an award for Dr. Nnamdi Azikiwe who is seen by all as the sole architect of the monstrous one Nigeria project that have brought untold shame, misery and consumed over 3 Million Biafran lives and still doing so till today. Had Nnamdi Azikiwe been blessed with the same parochial mind-set as Sir Ahmadu Bello and Chief Obafemi Awolowo then Nigeria would have evolved differently from this blood sucking, corrupt evil monstrosity that is the laughing stock of the world. What happened at Enugu should serve as a warning to any person or group promoting the continuation of this apartheid murderous one Nigeria project anywhere on Biafran territory. IPOB it must be said has made it very clear; we are not interested in a restructured Nigeria, all we want and prepared to settle for is outright independence, which can only be ascertained via a referendum. Anybody talking about restructuring is risking the anger of the people. With the notable exception of ECA and Ala-Igbo Development Foundation all other groups like Ohaneze Ndigbo favored by Abuja were the same people, alongside South East governors, that invited the murderous Nigerian Army under the guise of Operation Python Dance II to kill and slaughter innocent men, women and children for daring to demand to be free from Nigeria. They felt their pocket money from Aso Rock will dry up with the emergence of IPOB. Why not condoning the activities of the few that brought the event to a premature end, we must understand why they did it. The public rejection of Nnamdi Azikiwe and everything he stood for within Nigeria is a warning to those planning to hold similar restructuring gathering on the 16th of March 2018. It will be in their best interest to refrain from holding such event anywhere in Biafraland. Anything that could be seen to endorse the continued existence of one Nigeria will be peacefully resisted. Ohaneze Ndigbo is hereby warned to reorganise their event to focus on referendum and not restructuring. If they insist on discussing restructuring within Nigeria, they will encounter a worse fate. There are hundreds of innocent Biafrans in prisons and illegal detention centres all across Nigeria for no reason whereas not a single Fulani man has been incarcerated for the killing thousands of people by their herdsmen Miyetti Allah Cattle Breeders Association. A society, nation or country that condones the persecution of the innocent- in this case, Biafra agitators, whilst rewarding cold-blooded murderers like Fulani herdsmen, does not deserve to exist.